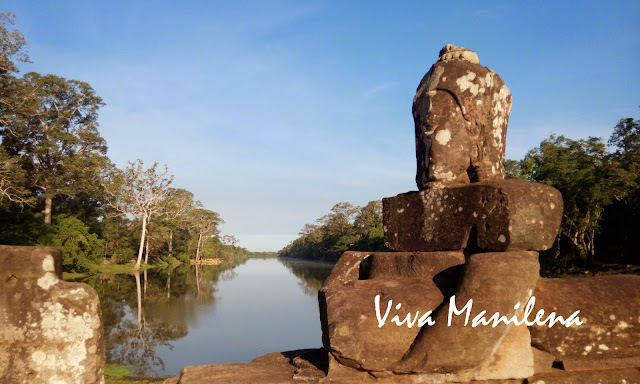 After Angkor Wat, the road leads to the Victory Gate of Angkor Thom. Most of the hired tuktuks, vans, buses, or even those on bicycles stops here to admire the bridge, the river and the gate itself. 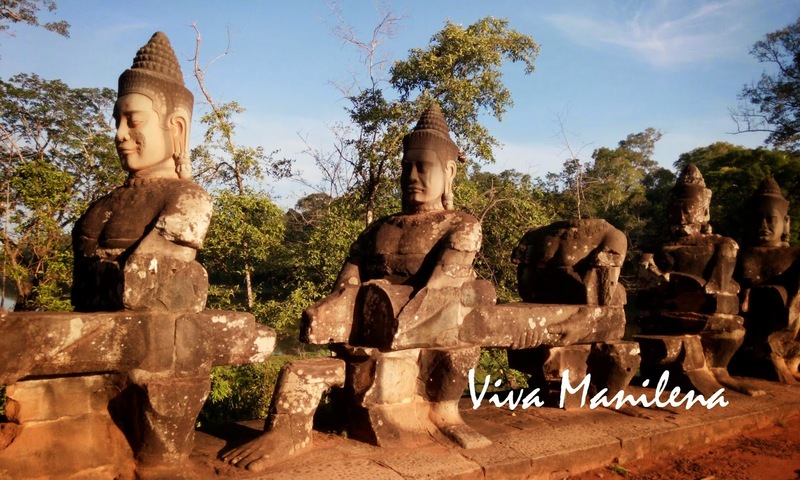 There was even an elephant and a monkey on two separate days that we visited Ancient Angkor. So our tuktuk driver left us at the bridge with instructions that he'll be meeting us at the other end. Most of these stone soldiers had new heads because the old ones were sawed off by thieves and sold to artifact collections via the black market. But even with or without heads, the figures doesn't fail to mesmerize visitors of Ancient Angkor. This is called the "Victory" Gate or the south gate of Angkor Thom which means "Great City." It includes Bayon Temple and Elephant Terrace. Note that there's a "brace" at the gate. This is to prevent it from collapsing. Parts of it are already undergoing restoration during our visit. 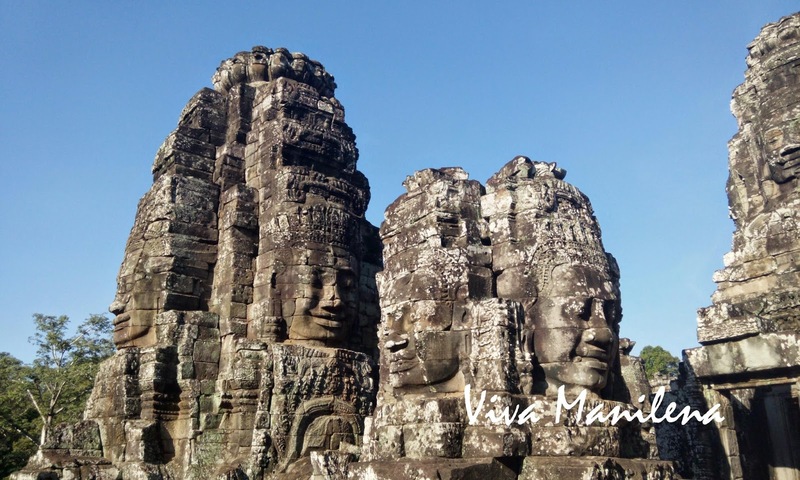 I have one word for Bayon Temple- breathtaking! Our tuktuk driver (he's called Wet) dropped us off at the west entrance of the temple. At first, I thought that he won't be stopping at this temple since we passed by the south and east entrances but I only realized now that he wanted us to avoid the big tour groups at the two entrances. 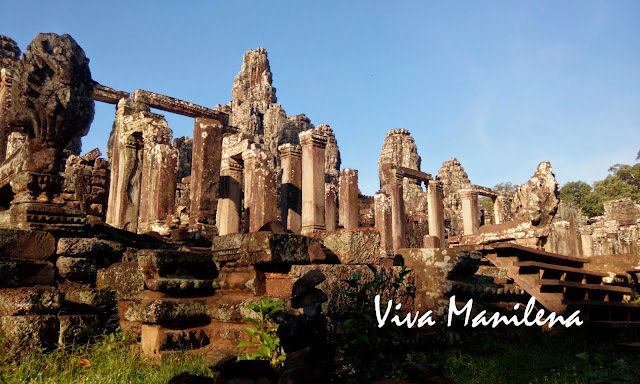 It was really only "us" when he dropped us off at the west entrance of Bayon except for the two heritage site officers who checked our tickets before waving us in. 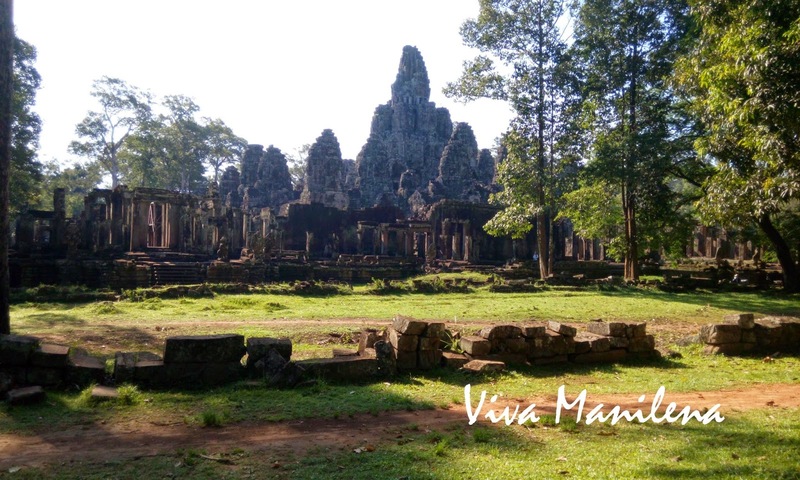 Bayon Temple was the very first temple that we really got to explore from bottom to top and vice versa. Everything here including the columns, the carvings, the statues are indescribable. I agree with a cousin when she commented that -- "it seem as if you have traveled in time." My friend and I were also able to appreciate this part of the temple sans the big tour groups. This is the famous serene face towers of Bayon. There's about a hundred of them all around the temple, some small, some huge. 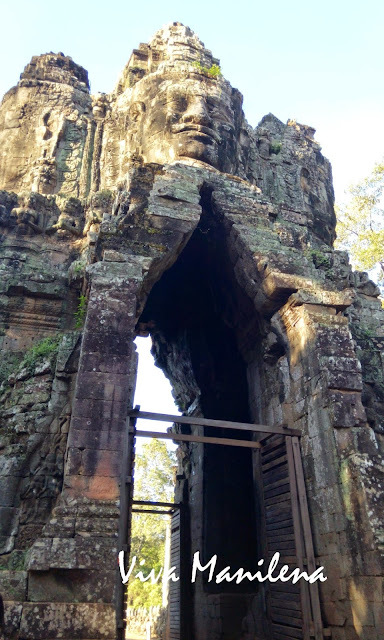 This is the entrance that leads to the topmost face tower at Bayon. 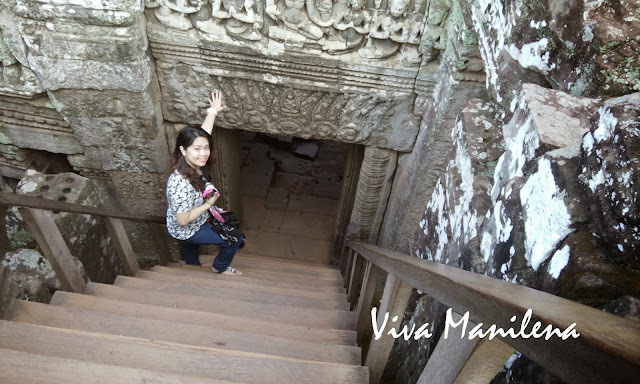 The lady seated on the steps was looking after one of the numerous deities/ Buddhas in Bayon. She will offer you lighted incense then will teach you how to bow to the deity and pray for good luck. There's a money bowl beside the deity and you are expected to give some donation. On an architectural note, notice that some of the columns are new as well as the entrance/ door. The old columns has an elaborate design or carvings compared with the new ones. As for the shadow, it came from the big face tower near it. 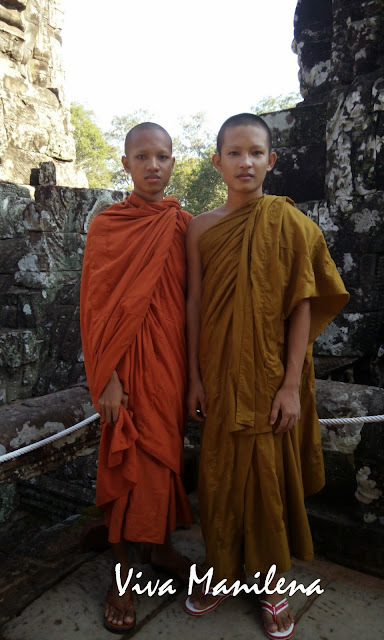 Lovely young monks in saffron and mustard robes. These are the only monks we saw during our first visit to Bayon Temple. That's my friend going down the steep and rickety stairs. Most of the stone stairs at Bayon had a chipped step or two so they built wooden stairs in almost all parts of the temple for easier climb (read: less prone to accidents). This is the temple's view at the north entrance. This part of the temple has huge trees. We exited here and walked till the Elephant Terrace. *** photos taken using Lenovo S960. What a wonderful place to visit! I hope to see more places next year. I've never been there, but looks like such a wonderful place to visit. Wow, such amazing places to visit. I'd love to go there someday. 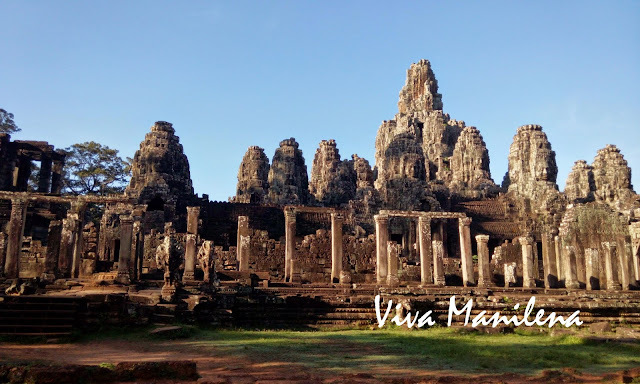 Based on your story and as mentioned by my friends and bosses, Cambodia is really a must-see country. I'd love to visit it someday. Beautiful! I'm itching to travel with my husband again. Hopefully we can go some time next year. The places that you've been to are incredible! The artisans who have worked hard to create these structures are simply admirable! What an amazing-looking place. I like learning about historical places even just through their architecture. What a great place. I sure hope we could visit outside the country soon. Oh my! 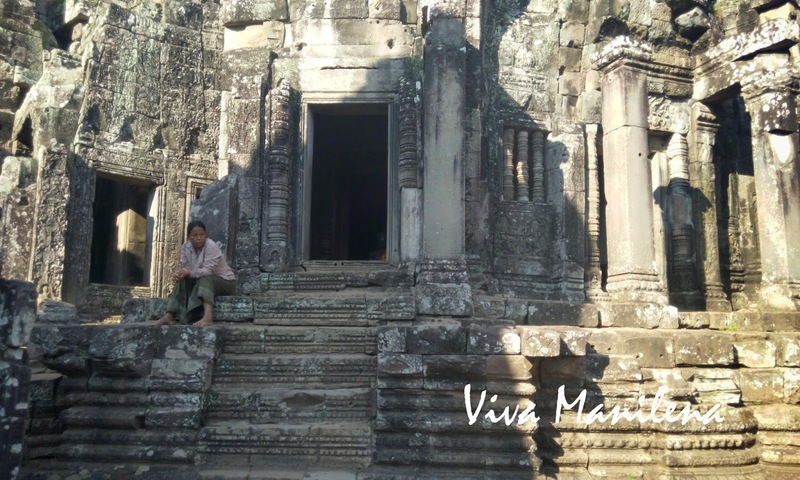 This entry made me miss Angkor Wat and the country of Cambodia. We loved our stay there a few years back! It's truly a wonderful experience.